I was up early this morning to check on my e-mails + do a bit of work online before me + the little man get ready for our activities for the day + guess what I first saw when my browser popped up? Lovely images, right? 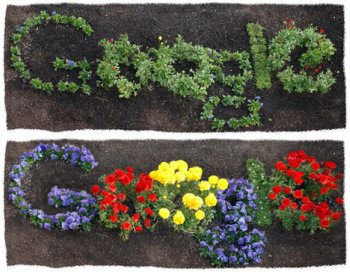 I got so curious about it, I clicked on the beautiful blooms as soon as I can + yes, it was indeed Earth Day today + Google put up those lovely flowers to get us all psyched to celebrate Mother Earth’s big day! The Earth Day was proliferated by then U.S Senator Gaylord Nelson, who called for an environmental teach-in, or Earth Day, to be held on April 22, 1970, after witnessing how the 1969 massive oil spill in Santa Barbara, California ravaged nature. In 2009, The United Nations made April 22 the International Mother Earth Day. It is now coordinated globally by Earth Day Network + is celebrated in more than 175 countries worldwide. Raise awareness in younger children by asking them to do little things for our planet. This could include tasks like turning off the lights when not in use, or turning off the faucet to conserve water. You can also buy your kiddos earth-friendly stuffs + toys. Today is a perfect time to commune with nature, so go ahead + visit the nearby park or the zoo. Take your picnic baskets, if you please, + enjoy one fine day savoring the goodness of nature all around us. Practice what you preach by doing things to help save our planet on a daily basis. Make “reduce, reuse, recycle” your new matra, + I bet you will never go wrong. 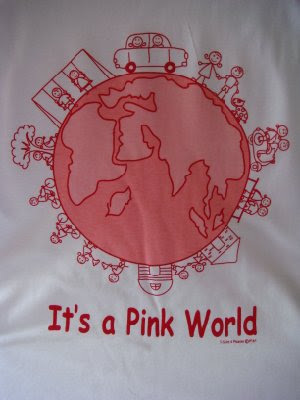 Since today also happens to be Earth Day, apart from Good Friday, here’ a photo of a pink world, which is a tee design, I managed to find with the help of Mr. Google. Very cute, right? I’d love to have one of these, only, the site doesn’t seem to be updated anymore since this particular photo was uploaded way back 2008. But, it’s a classic in my book, really cool. Chic + earth-friendly at the same time. Something for the girlie + the eco-mum in all of us! I guess now is the right time to not only reflect on our our lives + think of what we can do to make it better + to be of help to others, but to also commune with mother nature + think of ways we can do in our own homes in making this world a better place for our children (but that’s another story + requires a separate post! ).